A week after NBCU and Vox Media announced a new advertising program called Concert, the cross-platform ad play is ready for its close-up. 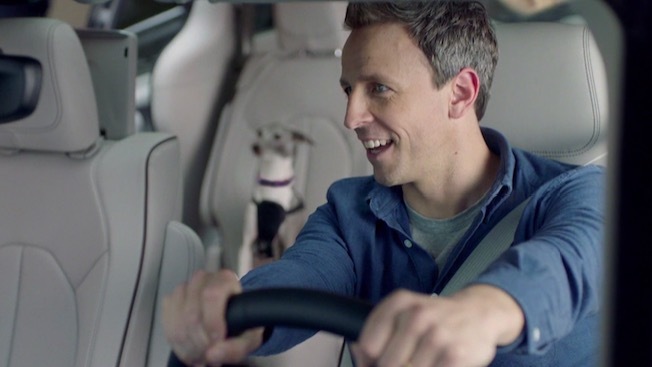 NBCU chose today, National Pet Day, to kick off the campaign for Chrysler's 2017 Pacifica while also promoting Universal's upcoming animated film, The Secret Life of Pets. Months in the making, the campaign kicks off this morning on the Today show. The program asked viewers to post pictures of what they think their pets do when they're not home. Carson Daly will share some of the best during the 8 a.m. hour and will then throw to a custom spot featuring Late Night host Seth Meyers and his Italian greyhound, Frisbee, inside a Pacifica. The spot, which you can see below, will take the show into its regular commercial break. Bounce from NBCU Content Innovation Agency on Vimeo. The spot will run across other NBCUniversal properties throughout the day, including Golf Channel, NBCSN, Sprout and USA Network, culminating with another live ad featuring Meyers tonight on Late Night, along with another custom spot and the debut of the new trailer for The Secret Life of Pets. NBCU will also be pushing other content with this campaign on its social channels. Vox and BuzzFeed will be creating their own branded content as well. Last summer NBCU invested $200 million each in BuzzFeed and Vox Media. "We've worked over the course of the last few years to really demonstrate that we can work across our owned media properties," said Alison Tarrant, executive vice president, Client Partnerships, NBCUniversal. "What this represents is really how we're taking our next step." Tarrant added that the company has been looking for a way to incorporate the film studio into these kinds of sales partnerships. "It was marrying a huge priority for Chrysler and a huge priority for NBCU," she said. Tarrant said the reason to go with Chrysler as its first client under Concert came from a longstanding relationship with the automaker and its agency Universal McCann. Three years ago, NBCU had a partnership with Chrysler's Dodge for Syfy's short-lived series Defiance, which featured an integration of the Dodge Challenger. "We were the ones that introduced the notion of reaching out to our film studios and really building this partnership around Secret Life of Pets," adds Tarrant. The launch campaign will conclude Tuesday with three more spots featuring Meyers, Frisbee and the Pacifica. All of the content and the new trailer will live on NBCU-owned Fandango as well. The campaign between NBCU and Chrysler will run through July, ahead of the film's July 8 release. NBCU plans another cross-platform push on Red Nose Day, May 26.